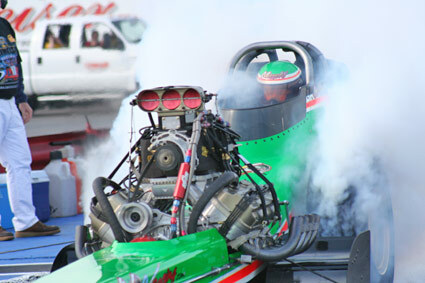 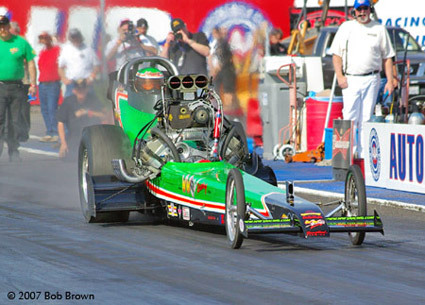 The 35,000+ fans that packed the facility over the three-day event were treated to over 500 race cars including 20 of the countries best Top Fuel dragsters including Jim Murphy and the WW2 Racing team. 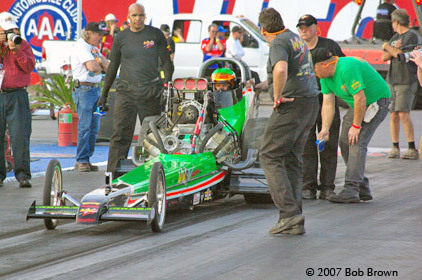 As he's done for several years, Murphy went into the event with his sights set on a stand-alone record. 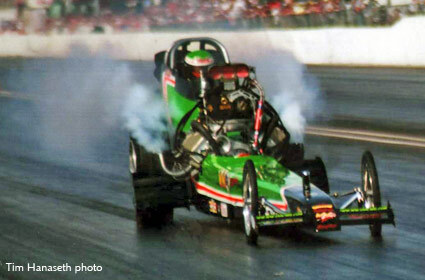 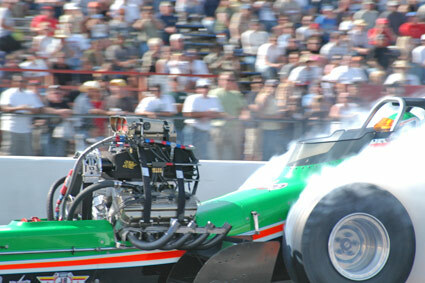 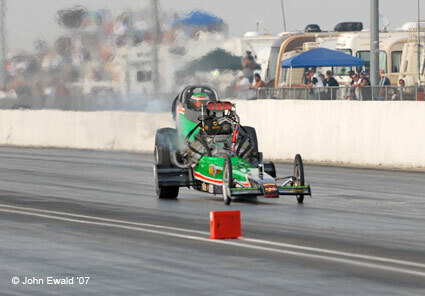 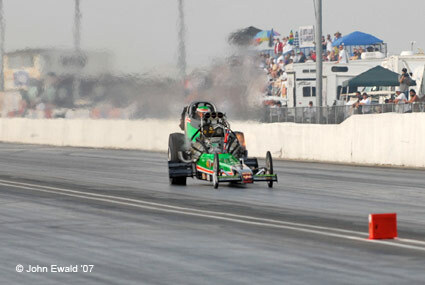 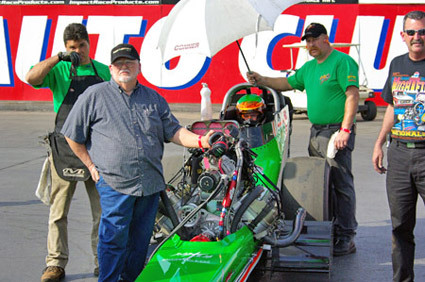 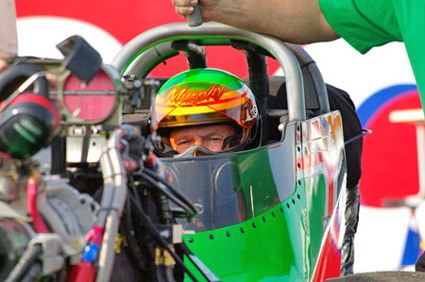 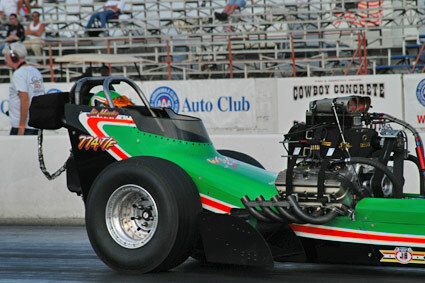 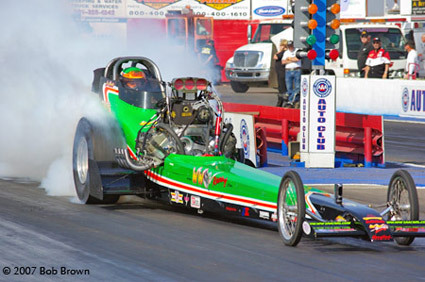 Not an ET or speed record but a record probably only he can break - a 5th March Meet Top Fuel win which he currently shares with Don Garlits. 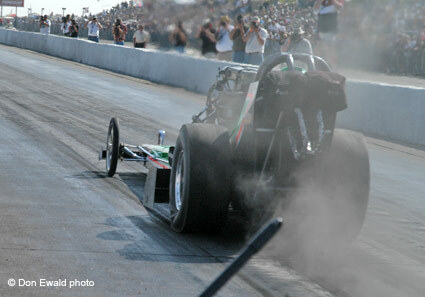 Murphy's dream held fast into the final round of racing on Sunday when the record was dead in his sights. 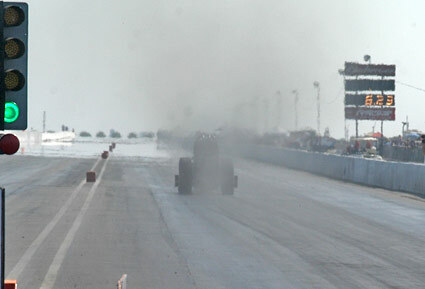 For reasons they have figured out, everything literally went up in smoke when the tires broke loose at the start and Jim had to watch Brett Harris streak to victory. 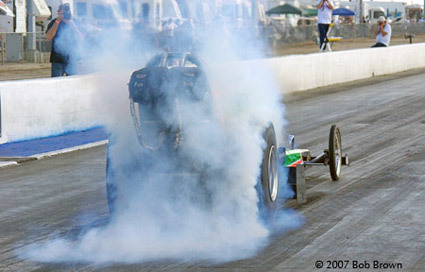 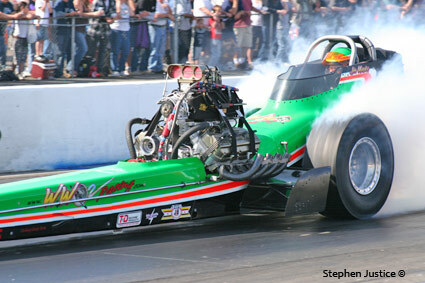 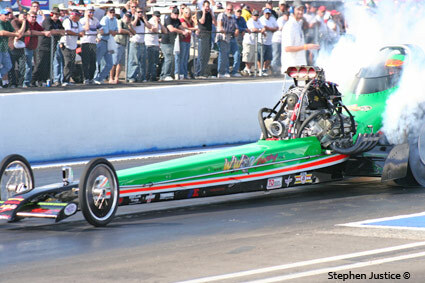 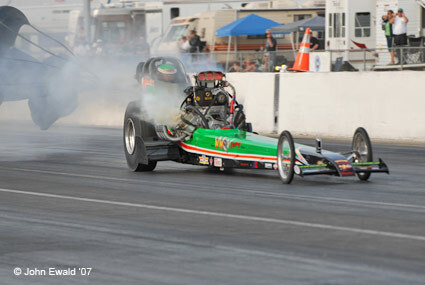 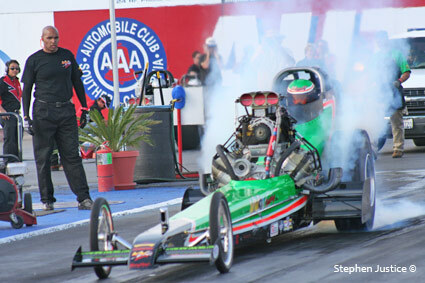 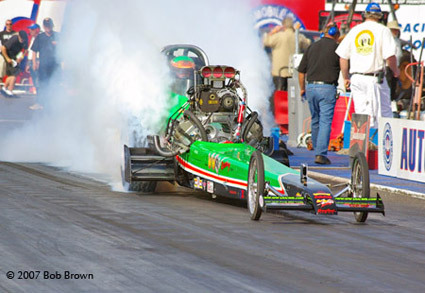 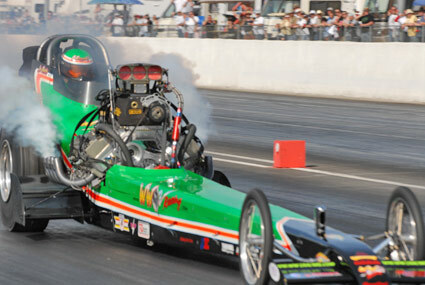 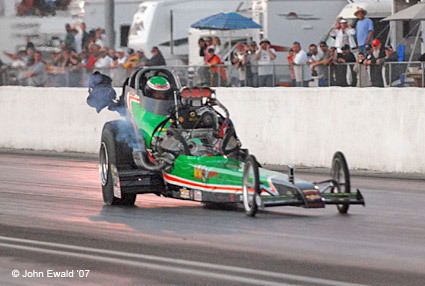 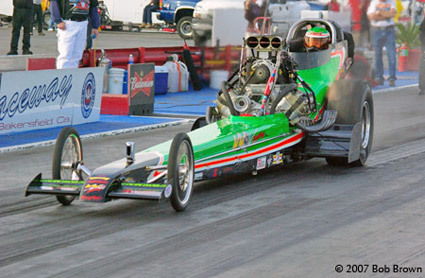 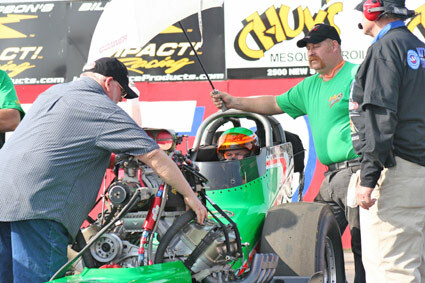 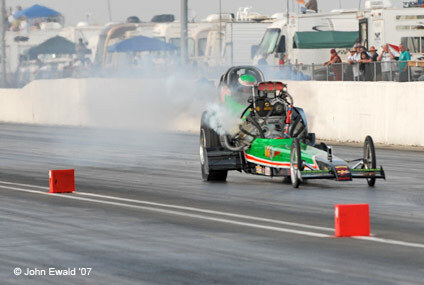 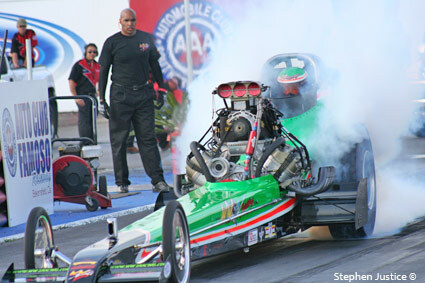 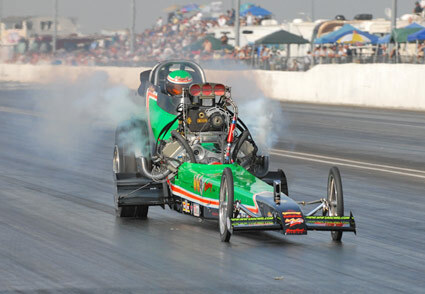 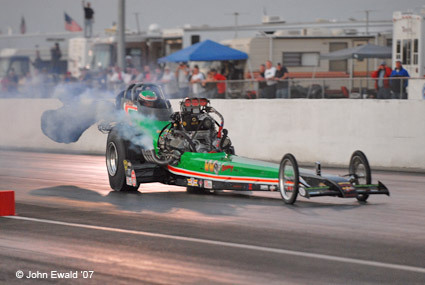 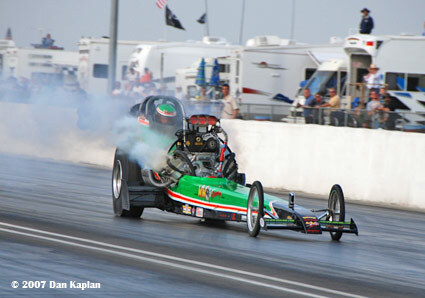 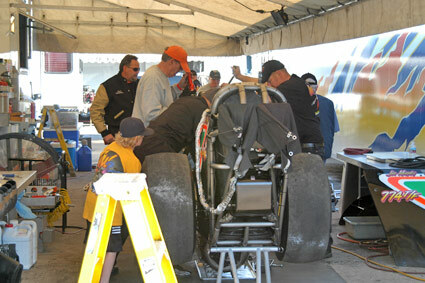 His dragster that had served him so well throughout eliminations simply had too much power in the end. 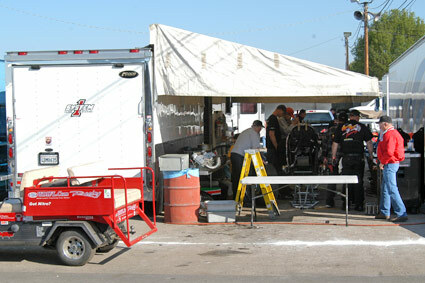 Under sunny skies the first session got under way at 2:30 PM. 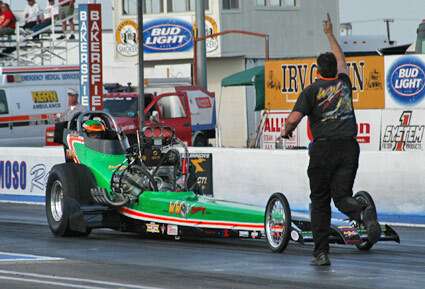 Murphy found himself the last car to make a shot and it would be a single. 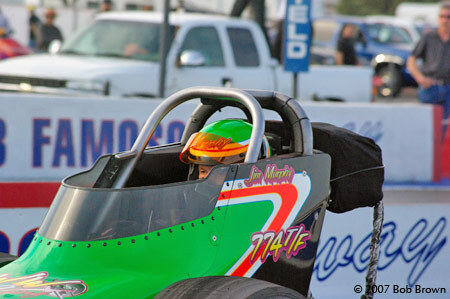 Crew Chief Tim Beebe awaits the signal to fire-up. 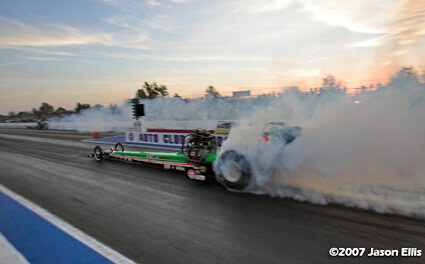 The green car sounded very good on the burnout - maybe too good. 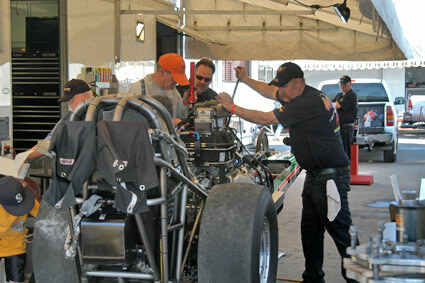 Dave Thornhill backs Jim up from the burnout. 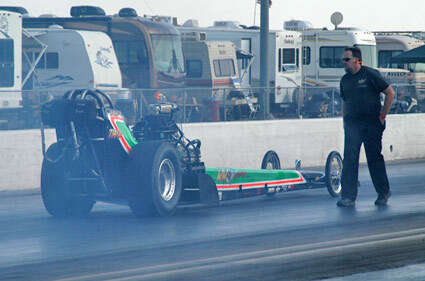 It's all good, Thornhill moves Murphy up to stage. 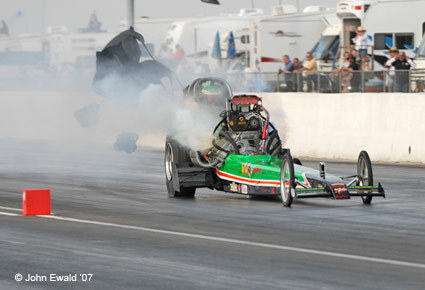 At the hit Murphy hiked the front wheels and was on a pass. 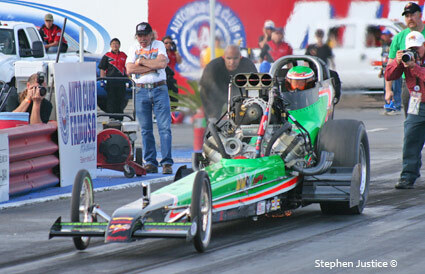 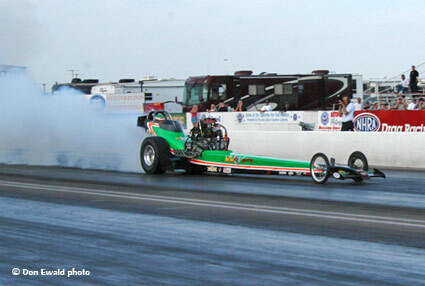 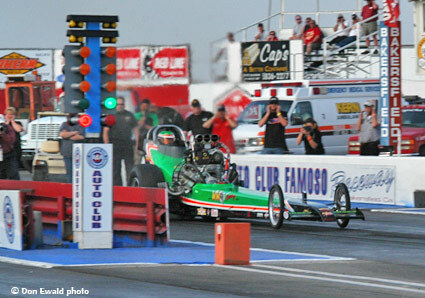 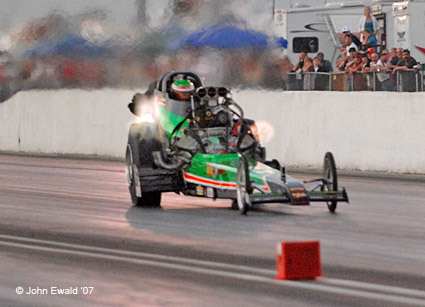 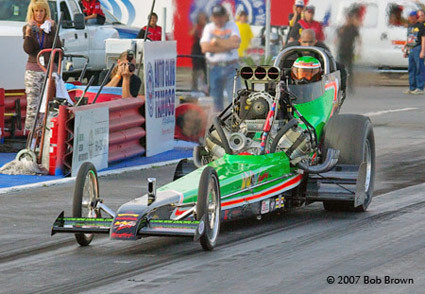 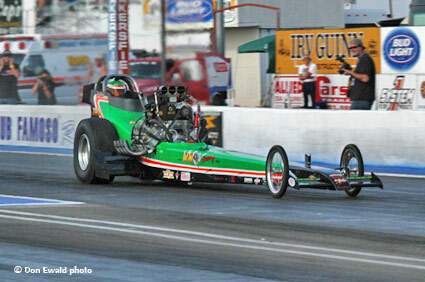 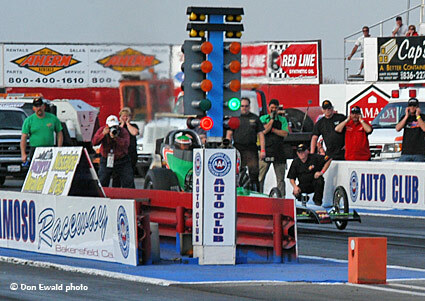 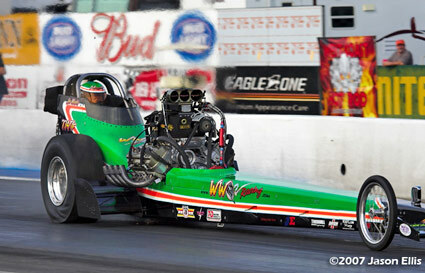 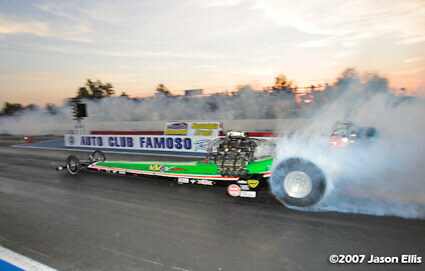 Before the first light Jim felt something amiss and shut it off and still ran a stellar 5.869 at just 229.70. 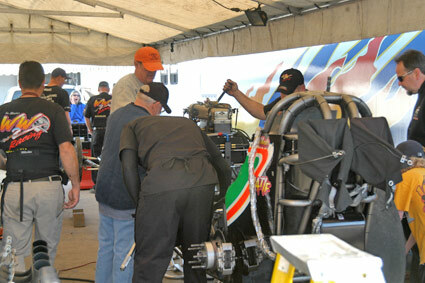 In spite of the engine damage the time established a very encouraging baseline for a weekend tune-up. 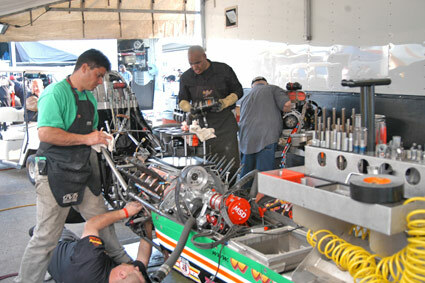 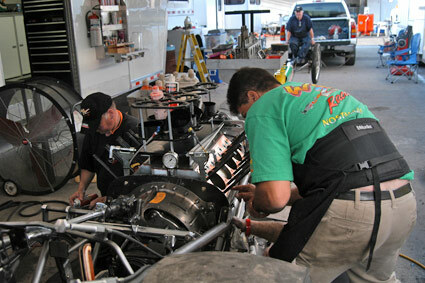 After the run the crew repaired the engine and got the car ready for session two on Saturday. 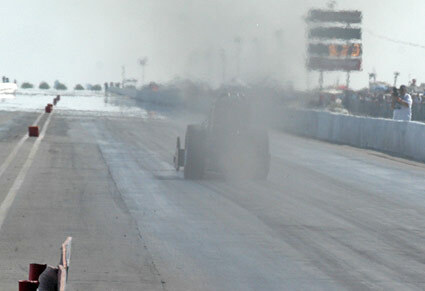 Once again Murphy was the last car to run in the session and had a single in the right lane. 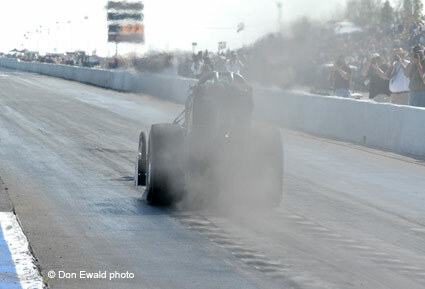 Amid a cloud of clutch dust Murphy left hard and the trained eye knew it could be a good pass. 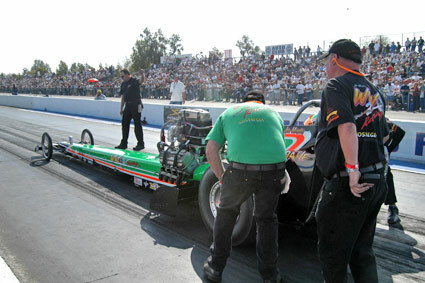 But once again Jim shut it off early to card a 5.920 at 241.09. 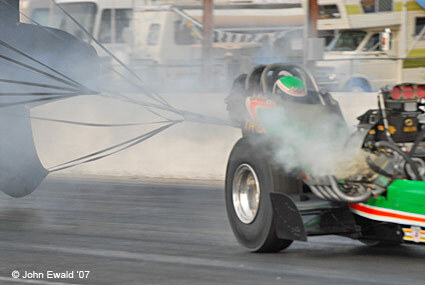 This was slightly slower than session one but with a better speed. 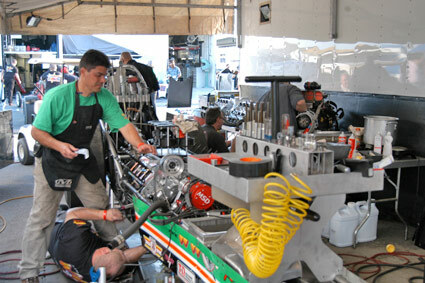 The crew preps the car for the third and final qualifying session. 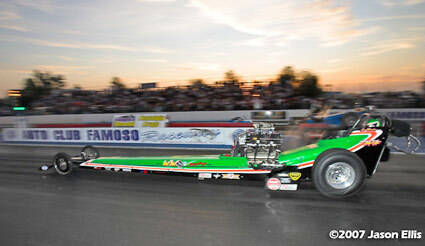 As the sun set in the West, Murphy was paired with Jack Harris for his third shot at the excellent Famoso track. 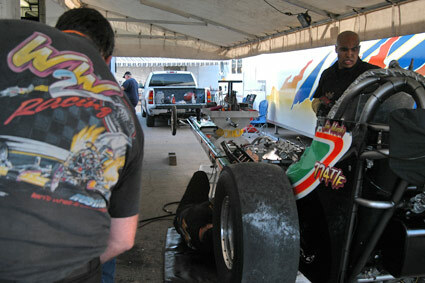 Murphy made a nice, clean 5.880 at 244.16 pass which landed him the # 5 spot in the 16 car field. 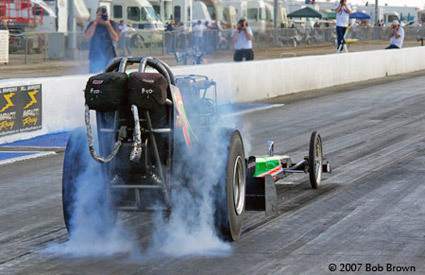 The run was particularly satisfying as it told the crew they finally had a consistent race car again... three runs in the fives.